Guests will arrive at the biggest conservation zone in USA, Everglades, the swamp national park where you can take an airboat ride known as “fly on the grass” to explore natural wonders and watch rare animals show. Guests will also get a chance to watch how to catch alligators on site. Next, you can appreciate the “City Beautiful”, Coral Gables, where described as an “International Residential Museum”. 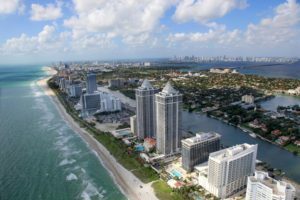 It stands out for its planned community that blends the wide tree-lined avenues, exotic mansions in Mediterranean Revival architectural style and historical landmarks such as the world-famous Biltmore Hotel and the Venetian Pool, both built in the 1920s. The picturesque Biltmore Hotel is backdrop of a renowned 18-hole golf course. Furthermore, Little Havana, the famous Cuban area attracts large groups of tourists from all over the world. You can visit Cuban cigar workshops and take a sip of Cuban coffee. In addition, tourists can take a cruise sightseeing around the Biscayne Bay which set off from the Bayside Marketplace. 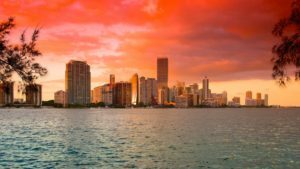 This cruise takes you by the homes of some of the world’s “rich and famous” (called Millionaire’s Row), along the stunning Miami Skyline as well as overlooking the America‟s second largest financial hub of the downtown Miami and more. Tourists will be impressed by the famous sea south beach with white sand, the clear blue water, and gorgeous scenery. Yet there’s more – the art deco street known as the No.1 district of Deco architecture with colorful buildings and a villa formerly owned by the well-known Italian fashion designer Versace. 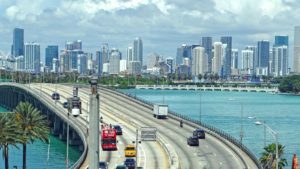 It is 170 miles from Miami to Key West through 32 islands and 42 bridges. It is also known as “Duck Island” because of its shape, and also the international Key West Film Festival was held here every year! World famous Seven-Mile Bridge is another highlighted attraction here. It takes eight years to complete and is quite famous for the magnificent scenery. The former California governor Arnold Schwarzenegger‟s movie “True Lies” was also filmed in Key West. The amazing scenery along the south nation and colorful beaches will make you feel in a fairy land. Here guests can take pictures with its landmark “the edge of the sky, the rim of the sea”. The next famous stop is the home of the former residence—Nobel Prize winners Hemingway. After that, tourists can buy some souvenirs in local stores. On the way back to hotel, guests will have a chance to see the fabulous sunset. We will travel to Lion Country Safari, West Palm Beach, Palm Beach and Fort Lauderdale today. The first destination will be Lion Country Safari. Guests will have chance to experience the real wild life here. This park is also claimed to be the first ‘cageless zoo’ in the United States. After, we will go to West Palm Beach. 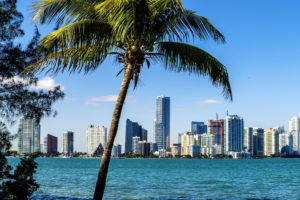 West Palm Beach is 70 miles distance from the north of Miami connected to the Palm Beach by cross-sea bridge. Palm Beach is viewed as America‟s “Riviera” which has 47 miles long coastline and hundreds of high-class restaurants, see-view mansions, and luxury hotels…In addition, we will also see the Henry Morrison Flagler Museum from outside, which is known as Whitehall with 55-room in Palm Beach. When it was established in 1902, the New York Herald proclaimed that Whitehall, Henry Flagler’s Gilded Age estate in Palm Beach, was “more wonderful than any palace in Europe, grander and more magnificent than any other private dwelling in the world”. Spend time at the Worth Avenue in Palm Beach, an upscale shopping district which was ranked as the one of the top 3 “Most Iconic” streets in America at 2013. By afternoon, we will head to the second largest shopping mall in Florida — Sawgrass Mills Mall. At a first glance, travelling around the entire of New York City seems like the mission impossible; however, our highly organized tour is especially designed for you to feel the core spirit of the New York, by visiting amounts of famous landmarks and museums to learn more of its unique history, and shopping in the world top-brand boutiques! By stepping up to the Empire State Building, guests could overlook the beautiful view of the central park and the entire of New York City. Empire State Building stood as the world’s tallest building for nearly 40 years, and has been surpassed in late 1970. Its name is derived from the nickname for New York, the Empire State. Nowadays it is still the most famed landmark of the city of New York. Also, Guests will have a chance to take a sightseeing cruise on the Hudson River to enjoy the city from a totally different view, as well as take pictures with the backdrops of Statue of Liberty and Brooklyn Bridge. In addition, USS INTREPID, the national heritage that costs $120 million, is reopen for visitors. Concorde supersonic airliner and a variety of aircrafts will be all in the exhibition for the guests to visit. Wandering around the world’s famous financial and securities trading center – Wall Street, taking pictures with the symbol of New York Stock Exchange – Charging Bull, and visiting Trinity Church, Times Square, Madame Tussauds‟. Of course, we will not miss the famous Metropolitan Museum of Art. The Metropolitan Museum of Art is the largest art museum in the United States with collections of more than 2 million works of art. In the end of the day, our tour bus will take guests see around the Fifth Avenue, Rockefeller Center, United Nations Headquarters, Ground Zero and the new construction of WTO – Freedom tower. . .
Day 7 :Philadelphia – Washington D.C.
We will leave for Philadelphia where known as the birthplace of American democracy. At the Independence National Historical Park, tour guide will arrange a free time for guests to walk around. Inside the Independence Hall, you will have a special moment of standing exactly where the Declaration of Independence and the Constitution were signed. You also won‟t miss the Liberty Bell, the Statue of Washington, Congress Hall, and other great attractions! Take pictures, and even better, add a smile! Then, we will head to Washington D.C. By stepping onto Lincoln Memorial, Vietnam and Korean War Memorials, our motor coach takes you in town passing by the splendid Washington Monument and Jefferson‟s Memorial. The National Air and Space Museum of the Smithsonian Institution, located in the area called National Mall, holds the largest collection of historic aircraft and spacecraft in the world in 161,145 square feet of exhibition floor space. Because the White House remains closed to the public, thus, guests will be only allowed to take photos from its outside. Furthermore, you surely don‟t want to miss the opportunity to take our exclusive cruise for sightseeing of the town on the Potomac River! In addition, along the way, you will see the Washington Monument, the World War II Memorial, the Thomas Jefferson Memorial and etc.